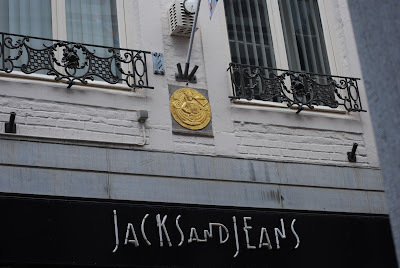 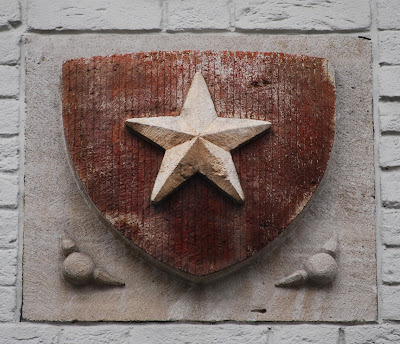 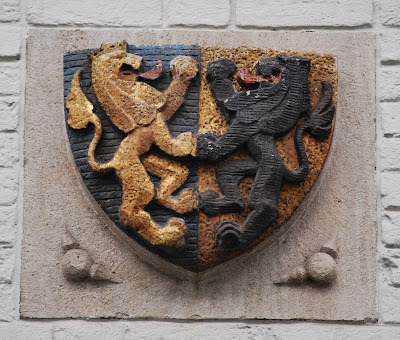 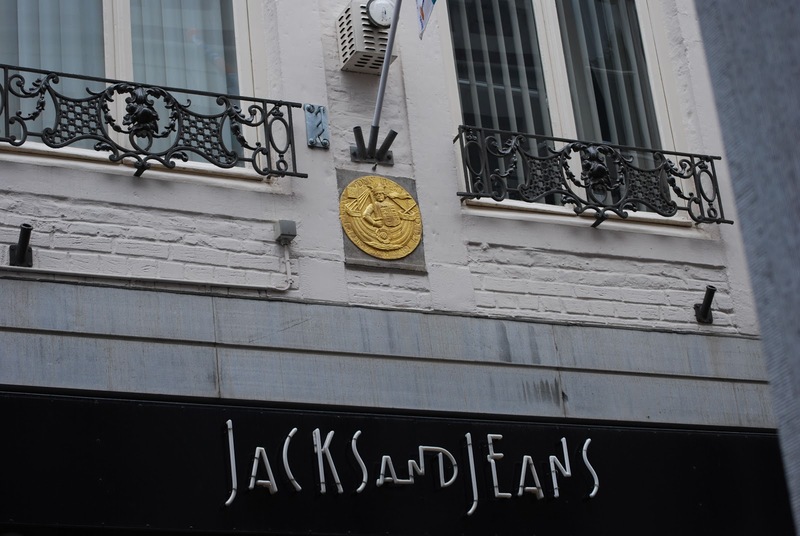 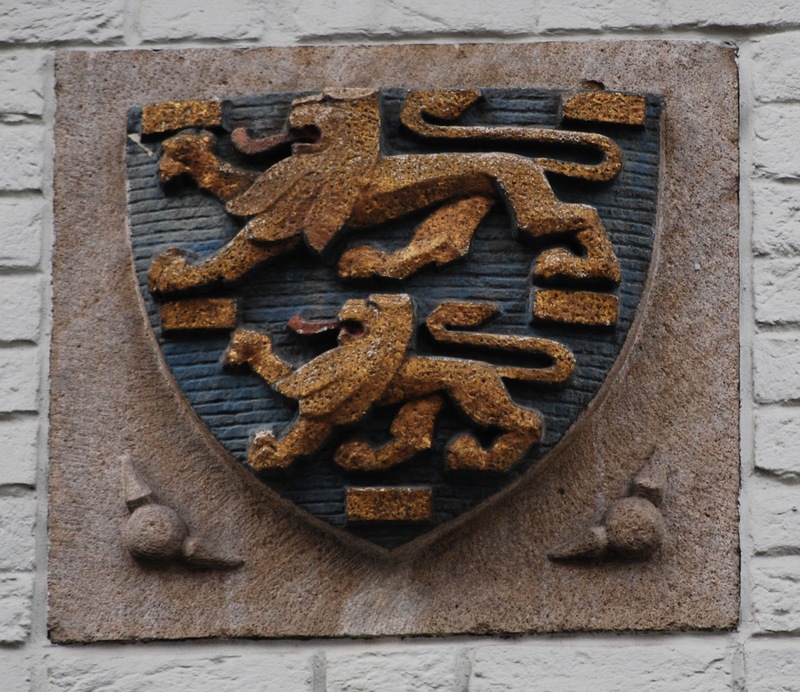 One bit of heraldry that I did not expect to run across in Maastricht was the following, used as a house sign; that it was the house sign for a shop called Jacks and Jeans was even less expected. 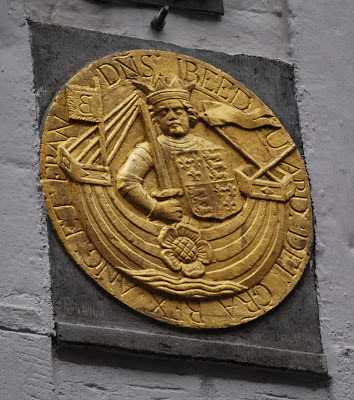 As you can see, the man in the ship is Edward, King of England, the legend around the image being the Latin (often abbreviated here) for, well, I'm not certain what the IBE stands for, but then we have "Edward by the Grace of God King of England and France" and then we have the DNS (the tilda above the N generally is scribal shorthand for another N; I don't know what that stands for, either. Nor do I know which King Edward this is supposed to represent. 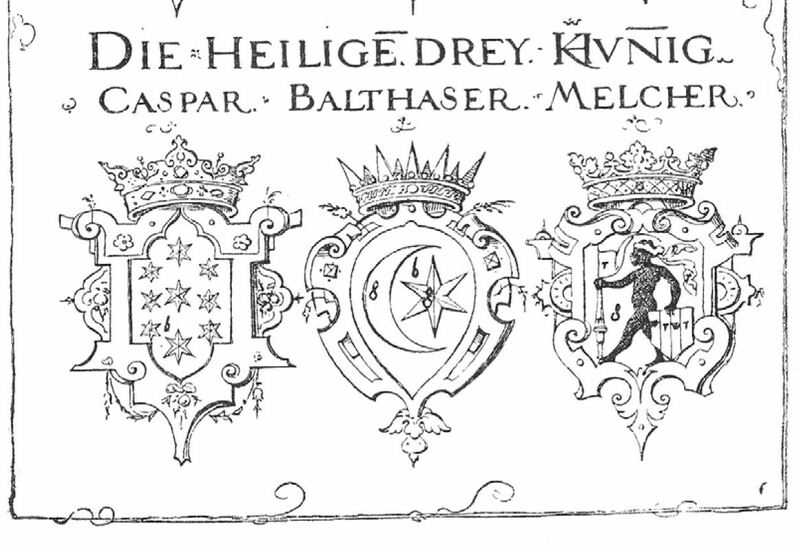 The French quarters of the Royal Arms have only three fleurs-de-lys (often called France Modern). 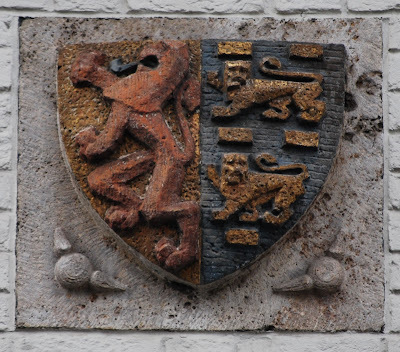 If this is accurate (and not just an error for the use of the earlier France Ancient, Azure semy-de-lis Or), the first Edward to use this version was Edward IV (reigned 1461-1470, 1471-1483). 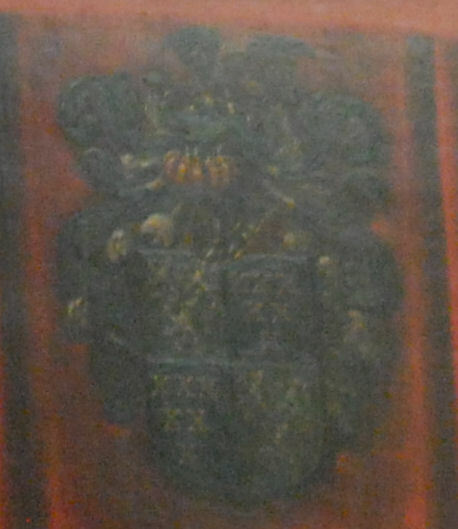 If that is not the case and the earlier version of the French arms is meant (for example, the depiction of Edward III in William Bruges' Garter Book shows France Modern rather than France Ancient), then this is Edward III (reigned 1327-1377), who was the first English king who quartered France with England on his shield. 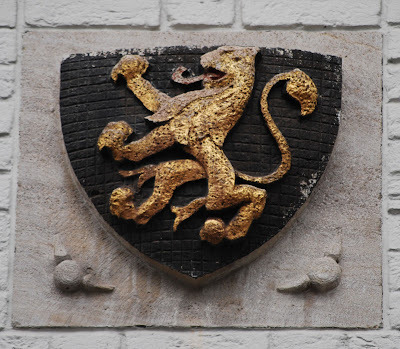 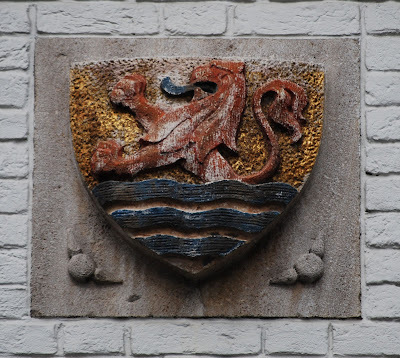 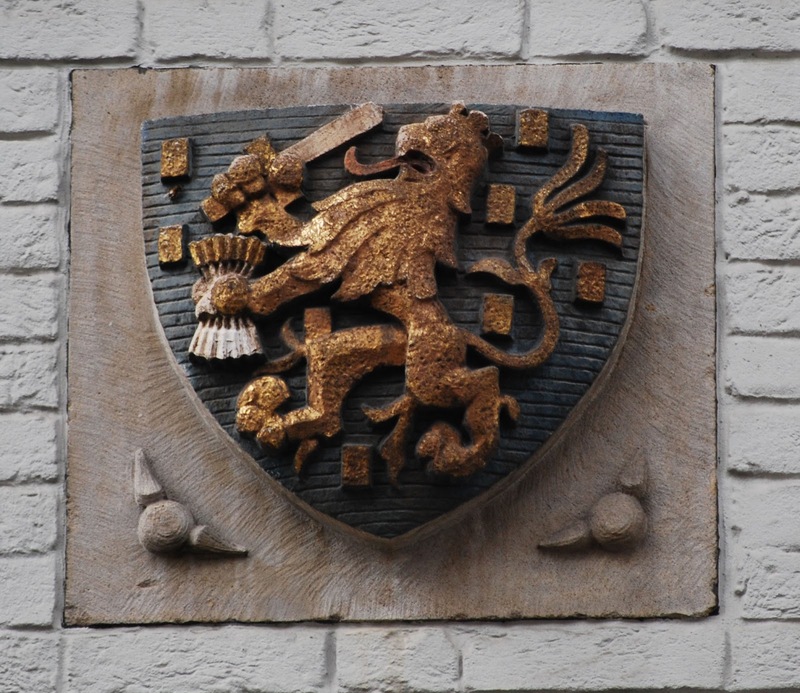 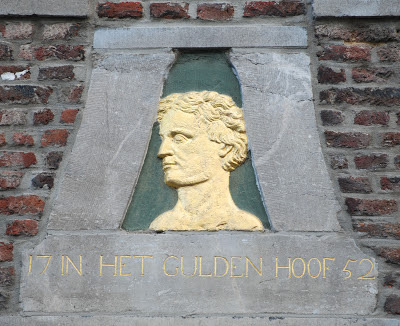 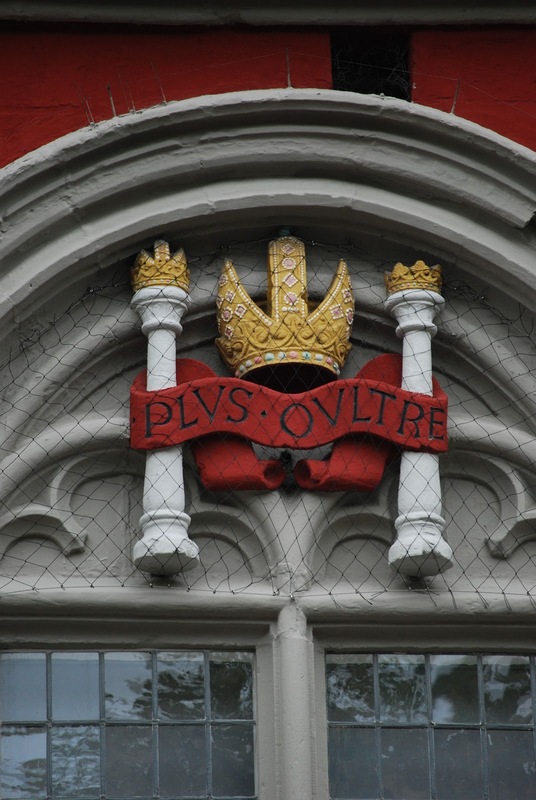 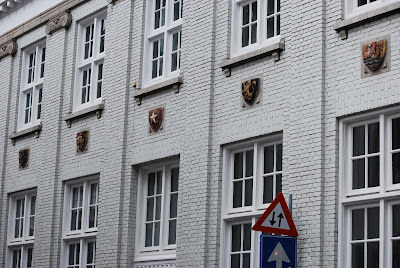 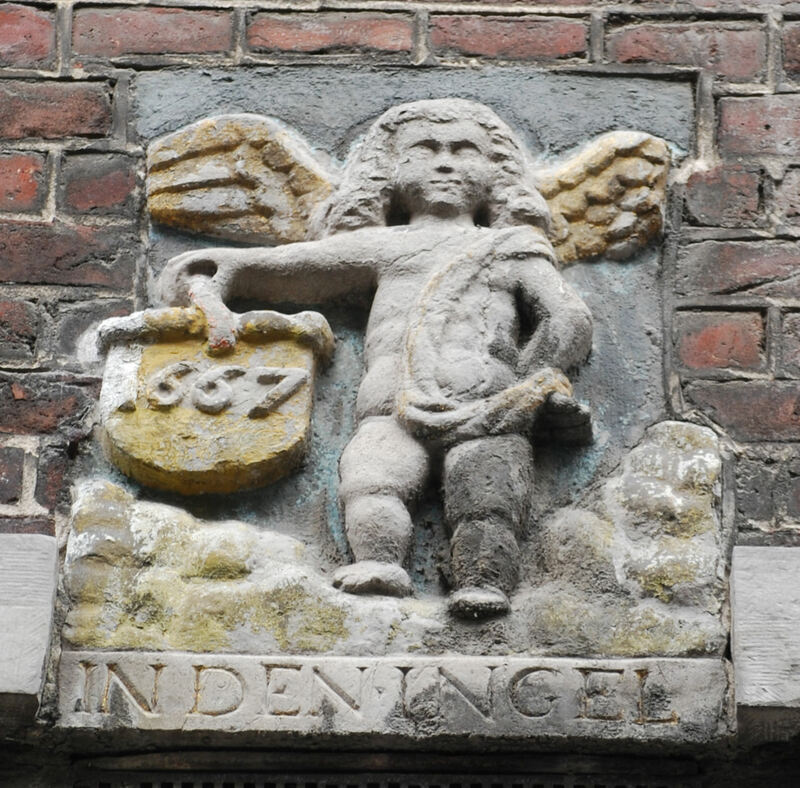 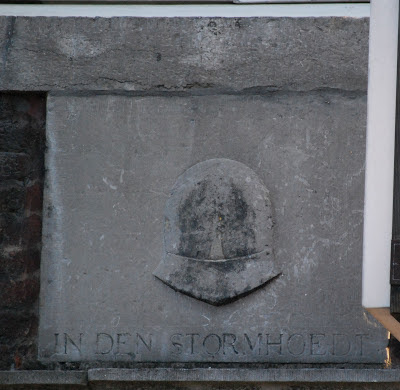 One of the things foreigners in the Low Countries notice, especially those keeping an eye out for coats of arms and heraldry, are the house signs one sees on the facades of buildings. 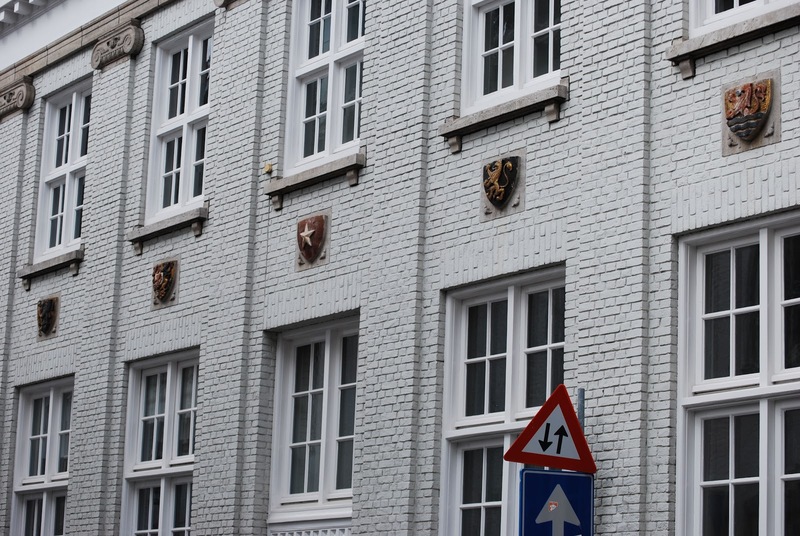 Maastricht was no exception to this; it seemed that every street I walked down (or up) there had buildings with these emblems on them, each one unique, and often also marked with a date (presumably that of the construction of the building). Such signs used to serve in the place of house numbers; one didn't look for a house number and street name, one looked for, e.g., the Golden Ram on X street. 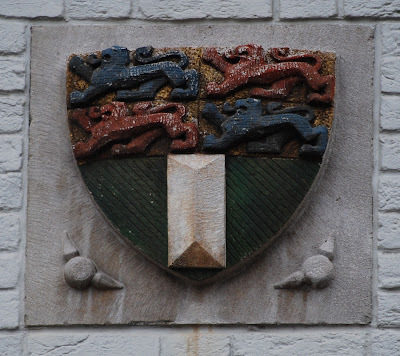 And, of course, many of these house signs could be considered heraldic in nature; certainly many of them share many of the same traits as good heraldry: good contrast, distinctiveness, animals in stylized postures, and easy identifiability. 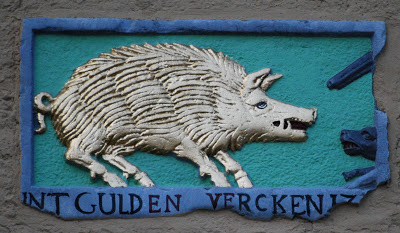 So with that introduction, here is a selection of these house signs I discovered in my wanderings about the streets of Maastricht. 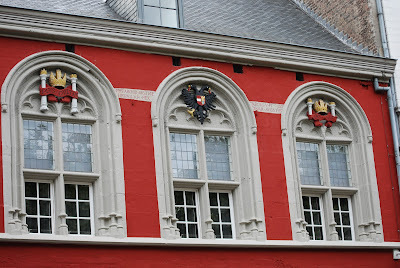 I’ve been so busy lately, what with working full-time, keeping my website up-to-date (well, sort of; it really needs a good going-over), doing all of the necessary weekly chores that come with owning a home and living a life, plus going through my photos from Maastricht heraldry to share with you here, that I’ve gotten a little behind in keeping up with some of the news items that crop up that discuss heraldry and coats of arms. The city of Grodno had held a contest for the best ideas to decorate the reconstructed Privokzalnaya Square. 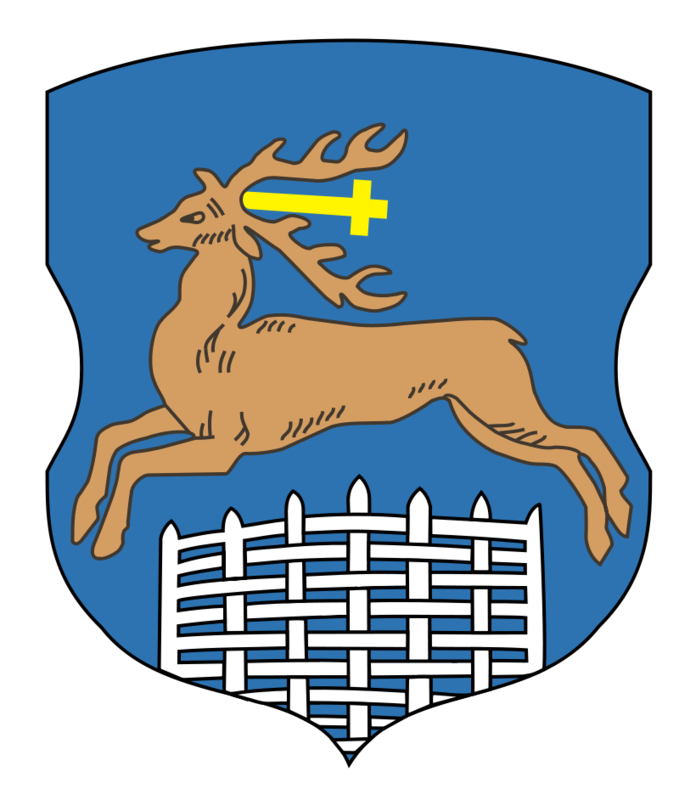 The winner was a sculpture of St. Hubert’s deer, a symbol depicted in the coat of arms of the city (a depiction of the city's arms appears below). 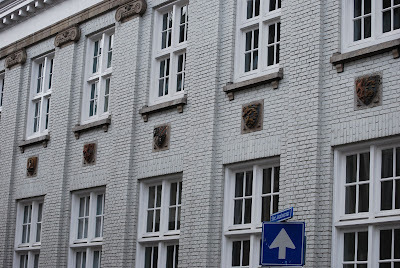 According to the BelTA article, dozens of proposals from artists and sculptors for decorating tourist routes in the city had been submitted. 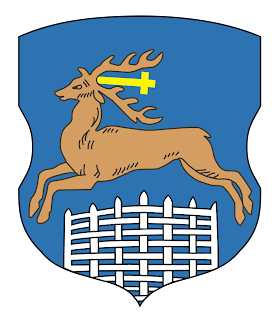 In the end, though, it was decided that the image of St. Hubert’s deer will remain the primary symbol of Grodno. 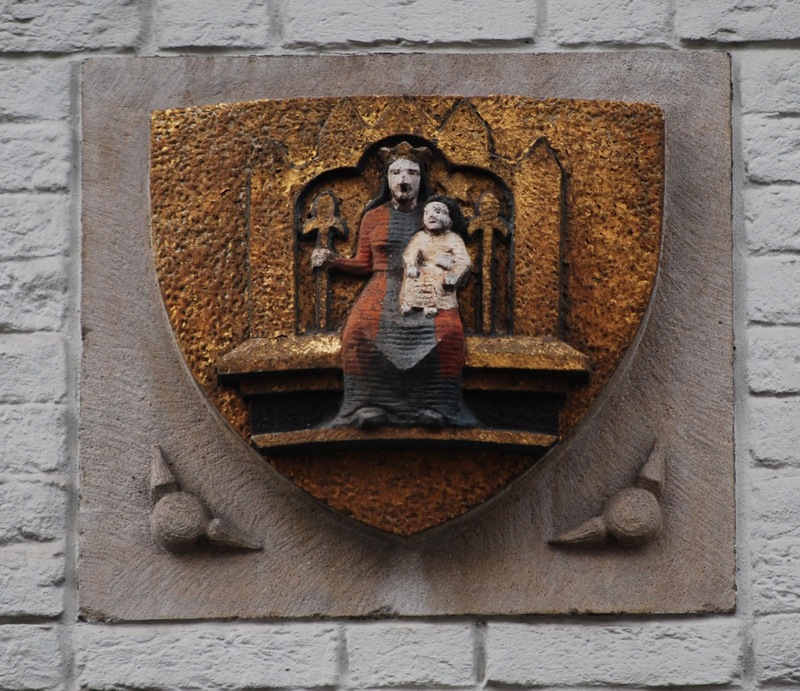 St. Hubert is called the "Apostle of the Ardennes," and was the first Bishop of Liège, Belgium. According to his legend, on one Good Friday morning, when the faithful were crowding the churches, Hubert sallied forth to the chase. 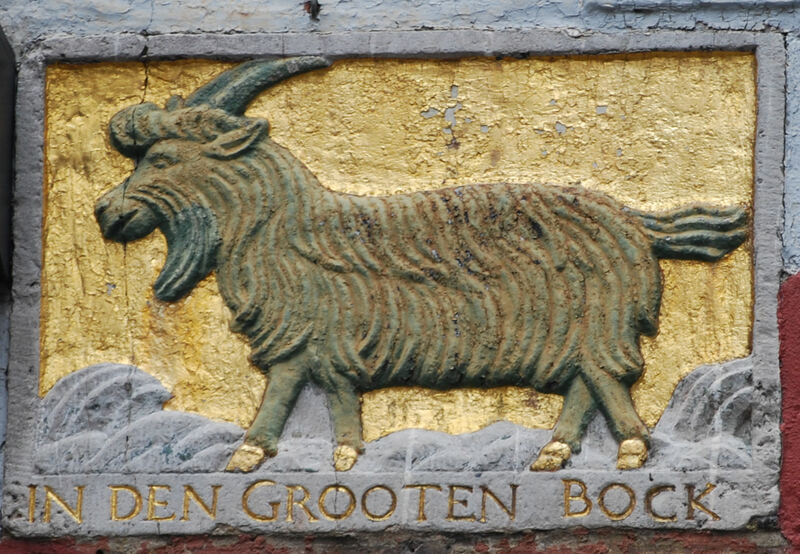 As he was pursuing a magnificent stag or hart, the animal turned and he was astounded at perceiving a crucifix standing between its antlers, while he heard a voice saying: "Hubert, unless thou turnest to the Lord, and leadest an holy life, thou shalt quickly go down into hell". Hubert dismounted, prostrated himself and said, "Lord, what wouldst Thou have me do?" 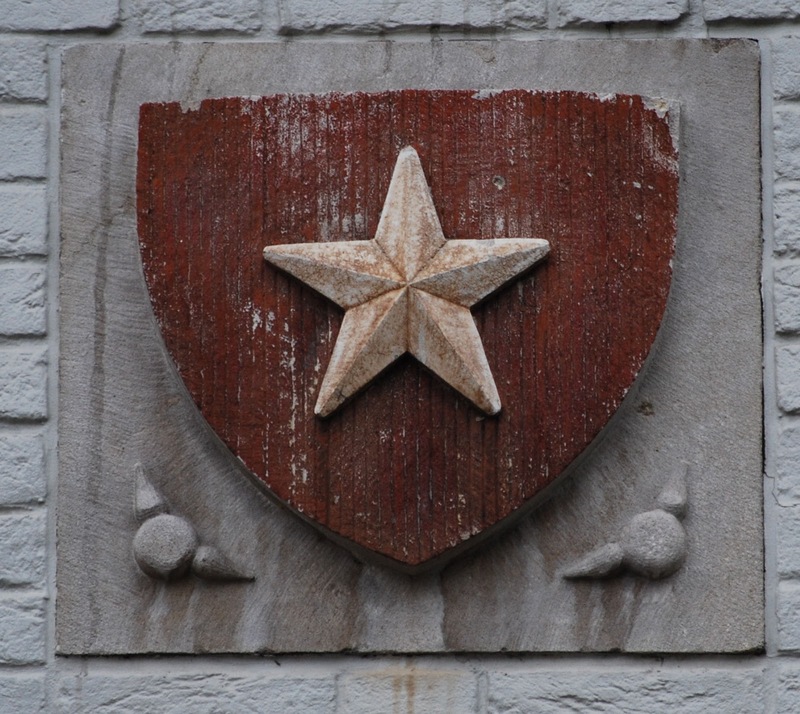 He received the answer, "Go and seek Lambert, and he will instruct you." He then renounced all of his honors, gave up his birthright to the Aquitaine to his younger brother Odo, and studied for the priesthood under Lambert in Maastricht. His symbol since then has been a deer or stag with a Latin cross or a crucifix between its antlers. 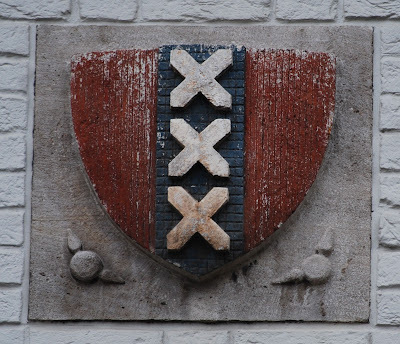 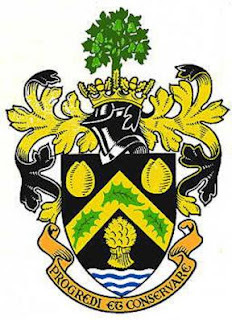 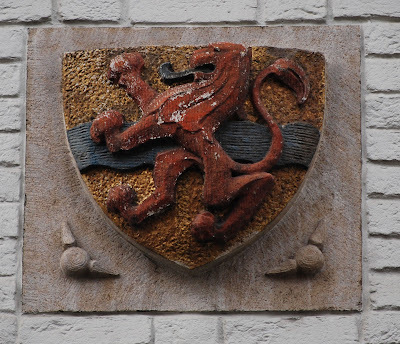 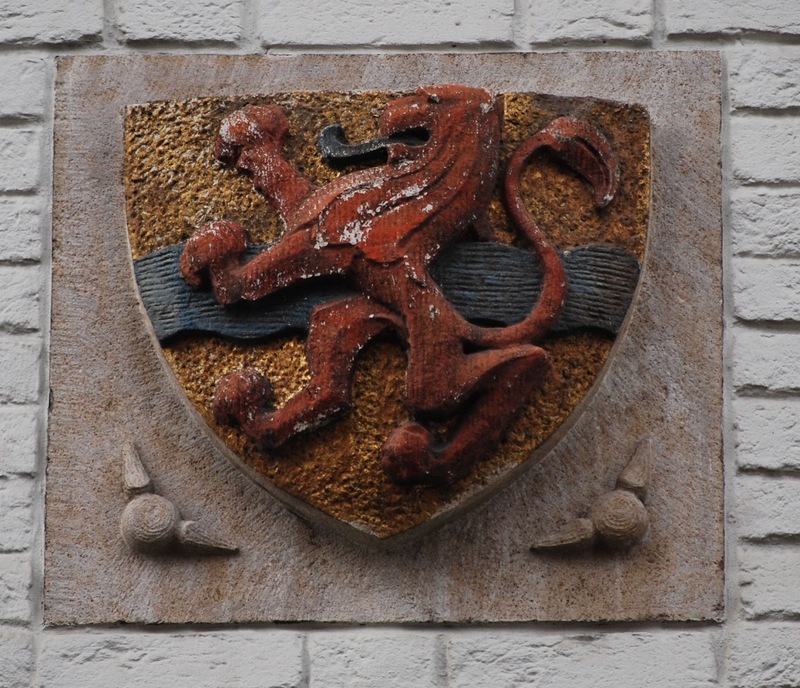 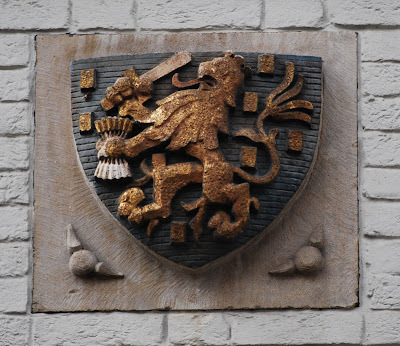 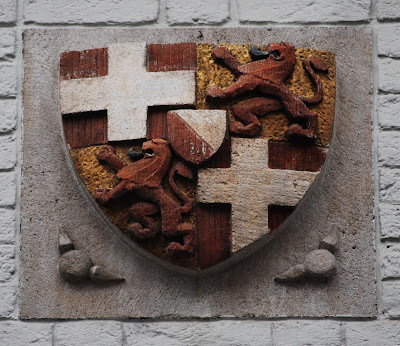 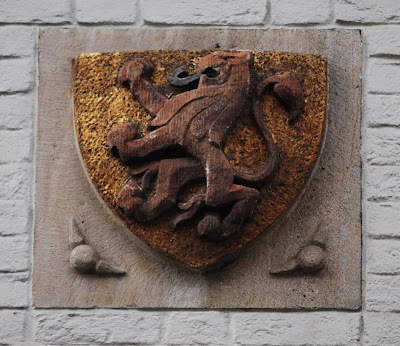 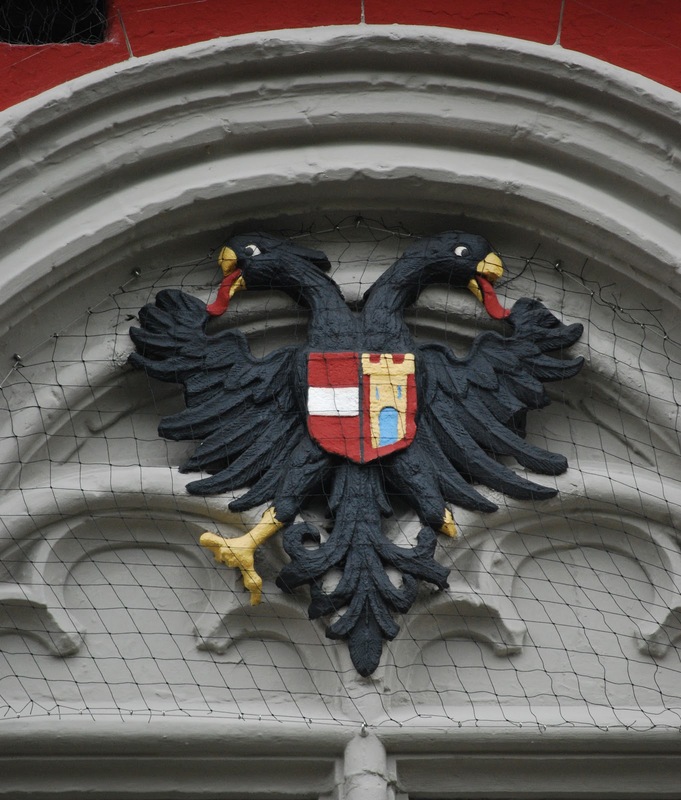 Isn't it great to see a city not only using, but expanding the usage of, its coat of arms? 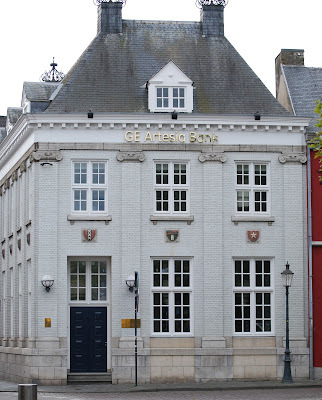 Next door to the Museum aan het Vrijthof (the red building just barely showing on the right in the photograph below, and which I discussed in my last post) is a white brick building housing the GE Artesia Bank. 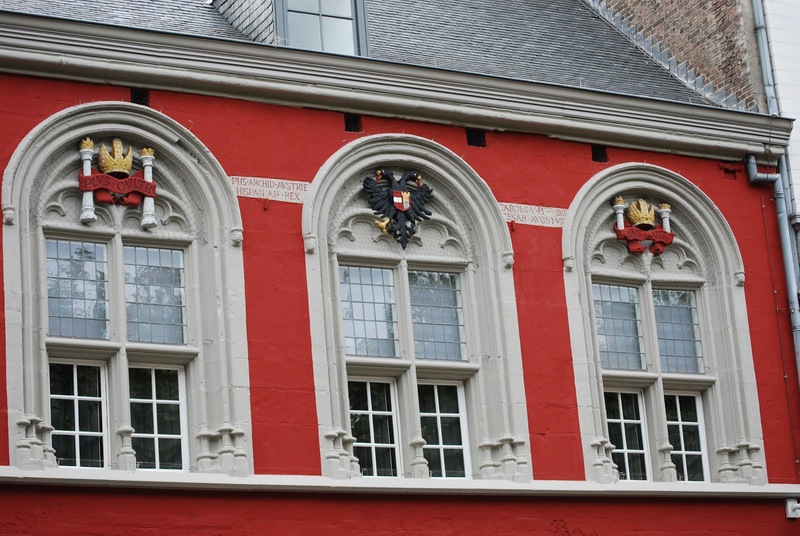 and across the back (above) is a row of some sixteen coats of arms (one is a duplicate; two of the arms, one on the front and one on the back, are the arms of the City of Maastricht), each set into the wall on a concrete (I believe) square. 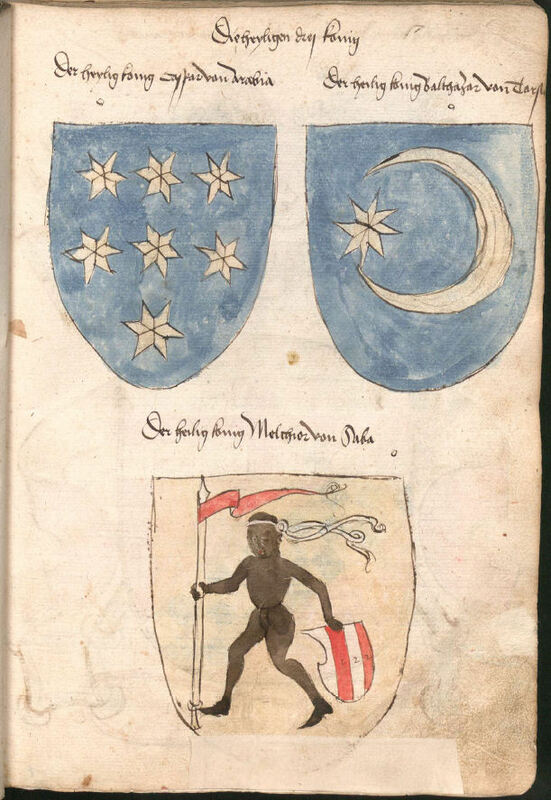 Isn't that all a great display of heraldry? 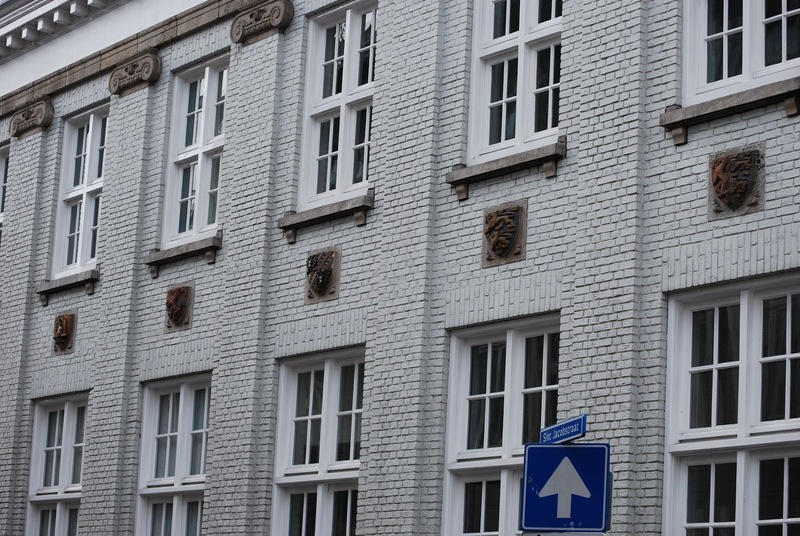 The facade of the building is dominated by a row of windows, the three on the right of which each have an arch above them which house heraldic elements. 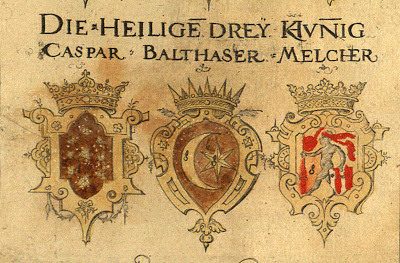 The central of the three has a rendition of the double-headed eagle, on its breast a shield marshalling the arms of Austria (the Hapsburgs were also known as the House of Austria and they used the arms of Austria extensively; the family arms were different: Or a lion rampant Gules armed, langued, and crowned Azure) and Castile. 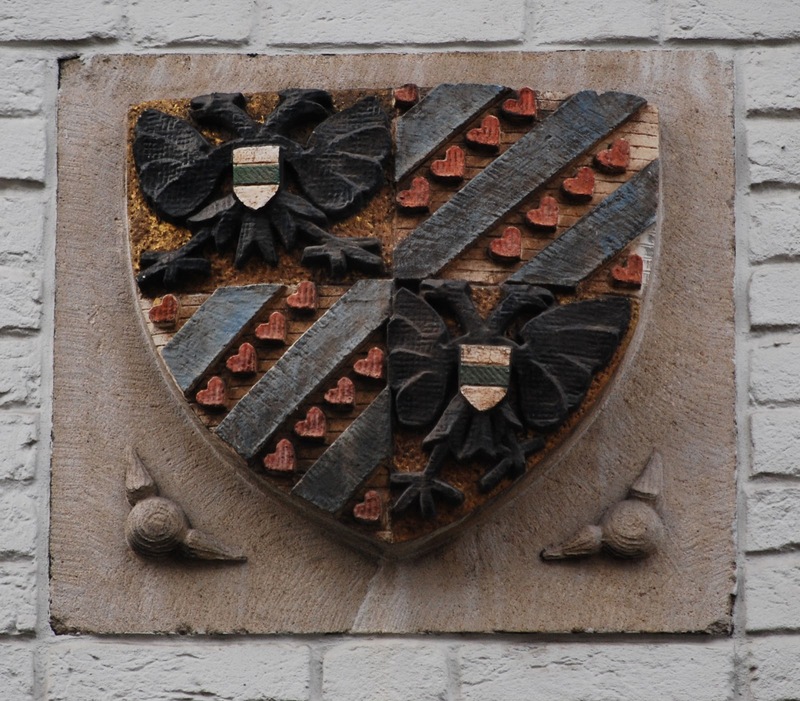 While impressive, it does seem to be a bit crudely painted. For the final heraldic offering from the ridiculously large number of photographs I took in the Basilica of St. Servaas in Maastricht, is this beautiful triptych set in a side (presumably private) chapel in the basilica. 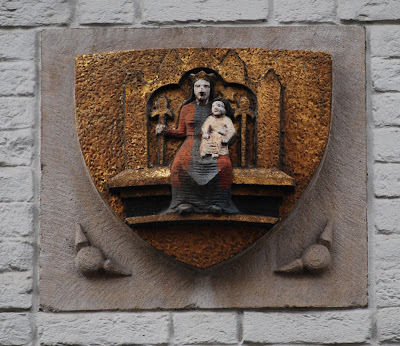 The central panel shows the martyrdom of St. Sebastian, with the side panels portraying the husband and men of the household on the left and the wife and women of the household on the right, each group with their own saint. 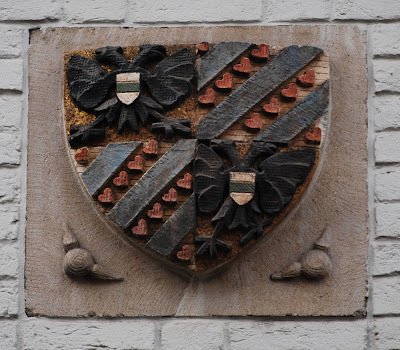 while the right-hand panel bears the marshalled arms of husband (as above) and wife (Or on a bend Sable three mullets Or) on a lozenge (as was appropriate for a woman, but certainly cramping the design of the husband's quarterly coat!). 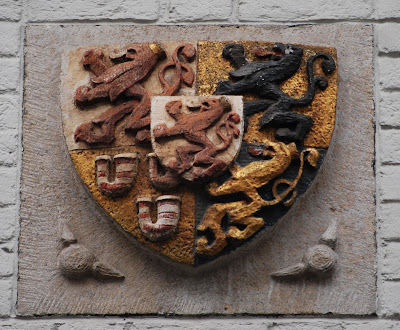 Continuing with more highlights from our heraldic tour of St. Servaas Basilica in Maastricht, there were lots and lots of carved armorial (and a bunch of non-armorial) memorials set into the floors. 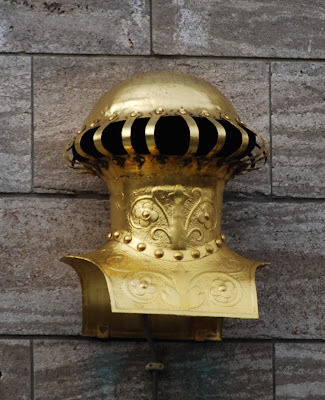 Some of the following may look like they were cast in metal, but they are all carved in stone, polished by the soles of the hundreds of feet which have walked across them over the years. The arms to sinister (to the right as you look at it) are reminiscent - though they do not match, as this one appears to be wearing a boot and the one below is wearing only a sandal, plus there is a star in dexter chief in the coat in Florence - the following coat of arms that I photographed in Florence, Italy a couple of years ago. 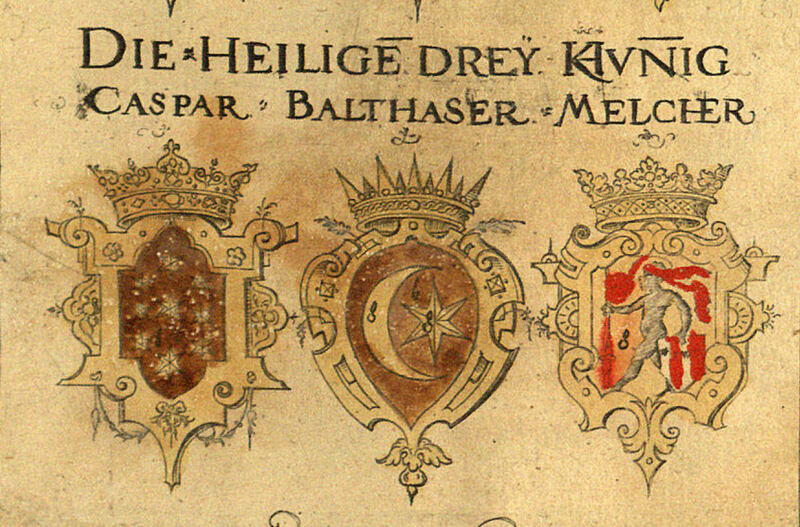 We now return you to the armorial memorials found in the Basilica of St. Servatius. 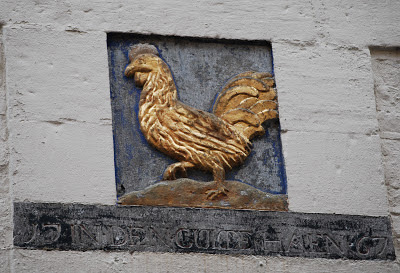 And finally, there was this example, which has been cut down (and probably moved from its original location in the basilica) to serve as a paving tile. 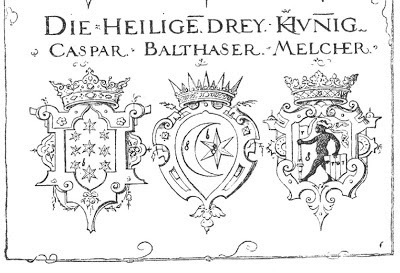 (Leading me to the question: "If they saw heraldry in half in a basilica, is it still considered to be heraldic heresy?") 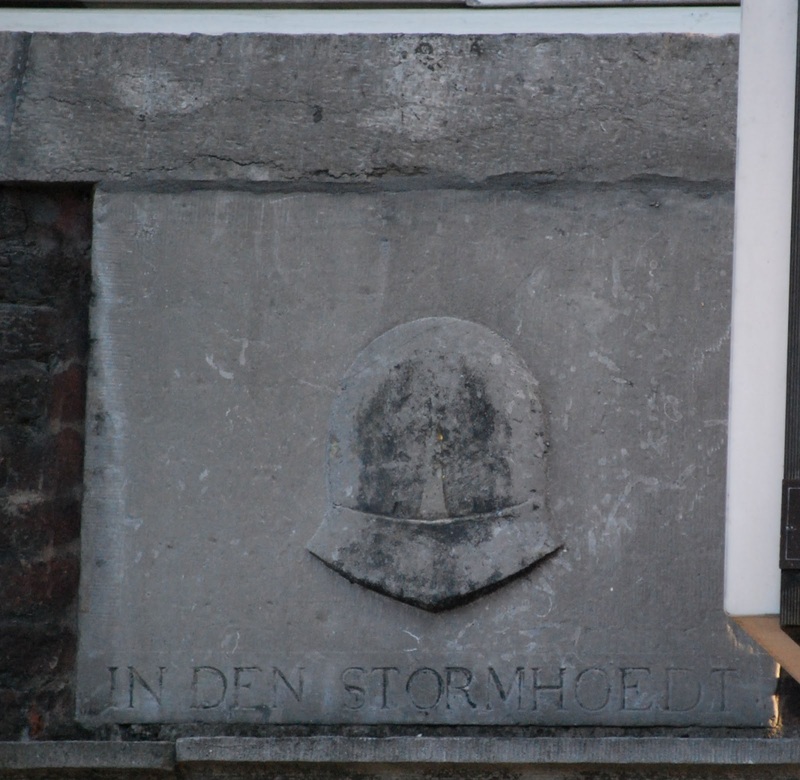 Admittedly, it does not appear that the arms of the individual buried there were cut down (those would be in the circle of which you can see the bottom arc here), but "only" those of some of his ancestors down the left-hand side of the memorial.